Moravian Talmudist of the sixteenth century. He was a pupil of Moses Isserles, who addressed to him many of his responsa, most of which are explanations of the "Sefer ha-Mordekai." It seems from No. 121 of these responsa that Schor's residence was at Posen, and from No. 112 that he was for a long time absent from his home, seeking a position in one of the German towns. The most prominent among his pupils was Joel Sirkes, author of "Bayit Ḥadash (BaḤ)." According to Fuenn ("Ḳiryah Ne'emanah," pp. 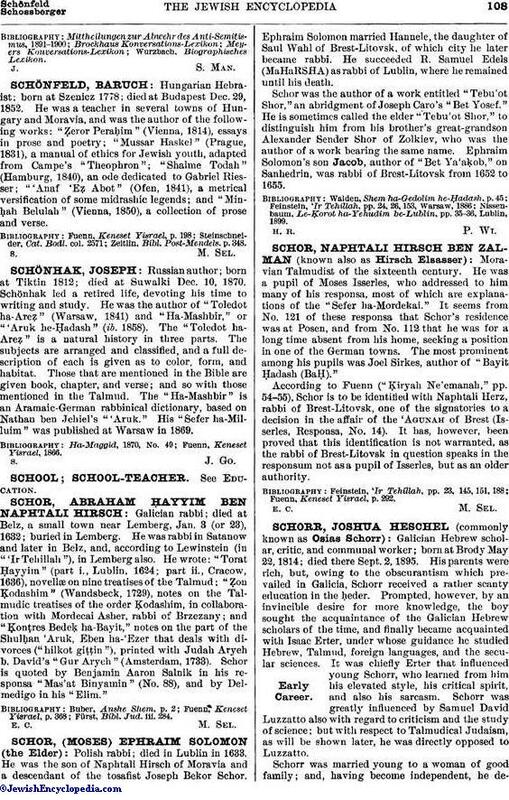 54-55), Schor is to be identified with Naphtali Herz, rabbi of Brest-Litovsk, one of the signatories to a decision in the affair of the 'Agunah of Brest (Isserles, Responsa, No. 14). It has, however, been proved that this identification is not warranted, as the rabbi of Brest-Litovsk in question speaks in the responsum not as a pupil of Isserles, but as an older authority. Fuenn, Keneset Yisrael, p. 292.